If you have been considering a change of career or are a movement teacher and would like to add Pilates to your qualifications please have a look at the enclosed Pilates Teacher Training brochure. All details of our up and coming courses are outlined in detail including times, dates, commitment etc. First up ths Autumn is Pilates at the Barre, followed by Mat. The course can be completed as the full 450 hour comprehensive PilatesTeacher Training course or as separate modules, there are payment plans available also.With our comprehensive 450hour Pilates Teacher Training programme students spend six months training in the principles and history of the Pilates Method according to the classic teachings of Joseph and Clara Pilates. We keep up to date with advances in science. 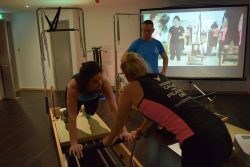 Our course covers the full Pilates repertoire on all the apparatus including Mat, Reformer, Trapeze, Barrel, Chair, Props and Barre. It is essential that Teachers understand the philosophy of Pilates and the overall vison of health and well-being that was so very important to Joseph Pilates and essential for us as teachers to grasp so that we can understand and past on, his exercises with the debpt and context that he intended and that forms the very essensce of “Controllogy” It is paramount that we understand and adhere to the 3 guiding principles and the Philosophy of Pilates set out by Joseph Pilates in his 1945 book Return to Life through Contrology; Whole Body Health, Whole Body Movement and Breath. We must understand the Pilates Movement principles and they should be present in every Pilates movement that we perform. Our school brochure will give you a understanding of our school principles, the course content, study requirement and schedule. Our school meets the Pilates Method Alliance criteria for inclusion in the Registry of Schools.